In the beginning was the Word, and the Word was with God, and the Word was God. He was with God in the beginning. Through him all things were made; without him nothing was made that has been made…. Guillaume Ouimet likes hockey, apparently. You can tell because he gets up at dawn so he can have the outdoor rink in his neighborhood (which apparently they have in Mont-Tremblant, Quebec!) all to himself. On January 9th he was working out as usual when a car rolled up and a guy got out with a hockey stick, skates, and gloves. The new arrival asked him from across the ice if anyone else was coming, and Guillaume said no. So the guy sat down in a snowbank and started lacing up his skates. You can tell Guillaume likes hockey because he recognized the guy almost immediately. 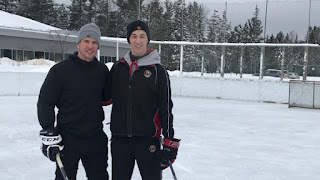 As his impromptu workout partner skated out onto the ice, Guillaume went over and introduced himself to Sidney Crosby, NHL legend and captain of the Pittsburgh Penguins. Crosby was taking a short vacation with his girlfriend in the Mont-Tremblant area and happened upon the rink. Crosby and Guillaume played and practiced for over an hour. At some point, Crosby’s girlfriend showed up and said they had to go. Twice, Crosby replied, “Ten more minutes!” She took some photos of Guillaume and Crosby together and later sent them to him. Good thing, too, as up until they saw the snaps his friends hadn’t quite believed him. It’s hard to believe because, in our experience, one of the results of fame is a disconnect from the world of “regular people.” Sidney Crosby doesn’t practice at neighborhood rinks with Junior AA players because he doesn't have to. That being the case, it’s no wonder that the story of Jesus has always been a little hard to believe. While most religions provide some path by which people can come to the Divine — through obedience or sacrifice or enlightenment or whatever — Christianity has the traffic moving in the other direction. Human beings don’t come to God — at least not initially. Instead, God comes to us. The proposition that begins John’s gospel is that he’s about to show us what it looks like when God takes on humanity and comes to us. What will he care about? What will he say? What will he do? John tells us that he comes to bear witness to truth, to bring light in darkness, to show us the way to God. And he does this by turning around suffering and death so that it becomes the way to glory and life — for him, and for those who believe in him. Hard to believe, yes. And so John shows us what happens when people take even those first, faltering steps toward belief. The church wrestled with that story for centuries, trying to describe it and quantify it, categorize by inventing vocabulary and creating documents that purported to be the final word. In some ways, we’re still wrestling with it. For some of us, Jesus just came to die on the cross for our sins, and the way to salvation is just to acknowledge that happened and thank him for it. But John and the other Gospel writers say much more than that in their retellings of the story. For them, those years between his birth and his death and resurrection mean something. For some of us, Jesus is a good teacher, chiefly useful because his words can be made to conveniently fit whatever we’d like them to fit. But the story isn’t about using his words to support our own opinions, but that he is God’s Word to us. We aren’t supposed to use his teaching as much as we are to hear it and live it. We, church, are supposed to carry with us the snapshots of our encounters with Jesus. When people have a hard time believing this story, we’re the evidence. When we think and humble ourselves and empty ourselves out of love like Jesus did, we answer the doubts. We respond to those who think it isn’t possible with proof that it is. That Jesus did come to us. That he lives with us, that we’ve met him. And that they can too.